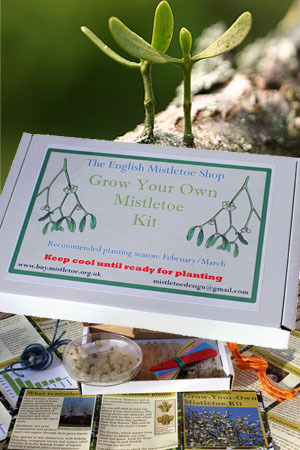 A kit to grow your own mistletoe – buy one for yourself, or as a gift for a friend. You will need to select a Spring Despatch Period to activate the Add to Basket button. Update March 27th 2019: Sorry, we are not taking any more grow-kit orders this season. Ordering will re-open in the Autumn for pre-orders for 2019/20. Please read the description below (scroll down or click here) for full details before ordering. You may also be interested in our Grow-Kit Gift Card option. 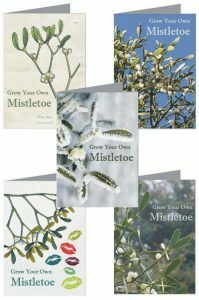 Our kits have been developed by mistletoe expert Jonathan Briggs, and are an improved version of the popular kits he designed for Tenbury Mistletoe from 2006-2009. Each kit contains 50 freshly-picked berries, enough for about 10 plantings, with detailed instructions, labelling material and a recording form to keep track of each planting. Kits cost £15.25 (including UK shipping – for EU shipping see below). An ideal romantic gift for gardeners, particularly as planting season coincides with Valentine’s Day. Coupon code ems10discount gives 10% reduction on order values (any mixture of products) £50.00 or over. The mistletoe planting season is February to April, and so our kits, with freshly picked ripe berries, are not sent out until February/March. To order please choose a despatch period* from the list above – the Add-to-Cart button won’t appear until you’ve selected a period. You can order any time from autumn onwards. If you want to give a Grow-Kit as a gift why not buy one of our Grow-Kit Gift Cards? These can be despatched any time, and are ideal for Christmas or Valentine’s gifts. The lucky recipient just has to return the voucher section to us (post-free) to get their kit delivered in spring. Full details of our Gift Card options are given on the Grow-Kit Gift Cards page. One last thing – you’ll need some patience, as mistletoe grows very slowly in the first 3 or 4 years. It’s well worth the wait, as once it gets established it grows quite fast, giving you plenty of kissing opportunities every Christmas! We take pre-orders from autumn onwards – so you don’t have to wait until February before ordering. Indeed you are more likely to be able to pick a despatch period that suits you if you order early! Please note that the seeds should be planted within 2 weeks of receipt – so do pick a period when you’ll be able to plant them. Our grow-kit boxes are letter-box friendly – and will fit through most modern letter boxes. Our kits have been developed by mistletoe expert Jonathan Briggs, and are an improved version of the popular kits he designed for Tenbury Mistletoe from 2006-2009. Please choose your Despatch Period from the drop-down option at the top of this page. The Add to Basket button will be clickable when you have chosen a Despatch Period. If your order value comes to £50 or over use coupon code ems10discount at checkout for a 10% reduction. Within the European Union: We can send grow-kits to other parts of the European Union at a cost of £18.50 per grow-kit including shipping. To order for EU delivery you can email us telling us how many you require, the despatch period (see above) plus your name and delivery address. You can send this information to us at englishmistletoeshop@mistletoe.org.uk or put the information in our enquiry form here. We will then email you an invoice which can be paid with with a Paypal account, or with a credit/debit card via Paypal (you do not need a Paypal account for this). The rest of the World: We are sorry, but we do not send our grow-kits outside the European Union.